Diamond fire is one of the most magical effects of a diamond. Learn the difference between fire and brilliance and the secret to maximum fire. Everyone has different criteria for what they want in a diamond. Some people want the biggest diamond they can possibly afford. Some want a particular cut or clarity level. Some want a flashy setting. For some, just finally receiving a diamond engagement ring after several years of dating - any diamond ring - results in the most desirable diamond. If you'd like a diamond with the most sparkle though, there are some terms you should know. You've probably heard of brilliance, but there is also fire. Read on to learn what it is and how to look for it. Diamond fire refers to the rainbow flashes that a diamond generates. As you turn the diamond, you'll see flashes of orange, yellow, green, purple, and blue light that almost look like fleeting bursts of fire (hence the name). Diamond fire is the result of dispersion of light. As white light strikes a transparent item (such as a diamond, glass, or water droplets) and passes through, the light rays slow down. In simple terms, this causes the white light to be split into various colors. This is also the same effect as a rainbow after a rain. A diamond is highly refractive, which means that it disperses light very well. This enhances this rainbow effect, causing the diamond fire. You may hear all three terms - fire, brilliance, and scintillation - used to describe a diamond. They sound similar, but they're different things. Brilliance describes the white light you see. Brilliance occurs when light enters from the top, bounces around and exits again through the top. Scintillation describes the flashes of light that reflect off the surface of the diamond as you move it. This is also often referred to as sparkle. Fire describes the rainbow colors you see due to dispersion of light. Fire occurs when light enters at an angle, slows down, and disperses into different colors. The best way is just with your own eyes. Most people prefer to just look at the diamond and decide whether it generates the type of fire they want. Different cuts of stones will display varying levels of fire. And different people may disagree about what exactly constitutes the best level of fire. However, nearly everyone can agree that diamond fire creates an amazing phenomenon in the stone, contributing to the almost magical aspect of a diamond. If you're looking for a quantifiable measurement of diamond fire in a particular stone, AGS Laboratories can create one of these using 3D scanning technology. You'll then receive a fire map of the areas where the diamond displays fire. The cut of the diamond is the most important for brilliance and fire. Cut refers to how the diamond's angles and proportions reflect light. In a well-cut diamond, the light will enter from the top, bounce around, and exit again from the top. This returns the light to the viewer. In a poorly cut diamond, the light will enter and leak out the bottom or side. It'll seem dull. If you want the most sparkly diamond, it's important to get the best cut possible. An excellent cut will display both incredible brilliance and fire. Where to buy diamonds with great fire. Whiteflash and Brian Gavin are two online jewelers known for exceptional cut quality. They offer super ideal diamonds cut in the most ideal proportions for the best light performance. James Allen also provides HD 360-degree videos of every diamond in its collection. So you can turn the diamonds at all angles to see what kind of fire they display. The light source also plays a huge role in how much fire you see. Without the proper light source, the level of diamond fire may be muted. This is why diamonds always look so extra sparkly in jewelry stores. They use the best combination of lights to bring out the stones' brilliance and fire. For indoor conditions, LED lights will show diamond fire better than a fluorescent light. Fluorescent lights are better for diamond brilliance (white light). You'll see better fire under a direct light source as well, such as sunlight or halogen spotlights. When outdoors, direct sunlight will show off the diamond's fire properties. A cloudy day (which produces diffuse light) will subdue the fire. Additionally, if the jeweler has colored lights in the store, rather than white lights, you may notice a greater fire effect in the stone that is impossible to replicate outside the store. When looking at a diamond's fire, always ask to see the stone in a white light, rather than in a colored light. We already mentioned that cut is the most important. Here are a couple of other factors that affect fire. Clarity. A lot of large inclusions (flaws within a diamond) can block light rays as they move through the stone, reducing the fire effect. Generally, we'd recommend SI1 or above. Dirt. If the surface of the diamond is dirty, it will block the light that's exiting the stone, reducing the fire effect that you'll see. So keep your diamond clean to keep it sparkling. Color. Whiter diamonds will display greater fire properties. If you love the look of yellow diamonds, keep in mind that they won't exhibit as much fire as white diamonds. Diamond fire is one of the most magical properties of a diamond. If this is something you want, then make sure to get a diamond with the best cut possible. An ideal cut will generate the most brilliance and fire. Once you see the diamond fire effect in a stone, we're sure that you'll love it. This is one time when fire and ice (the diamond) go together brilliantly! Shopping for a 1.5-carat diamond engagement ring? Learn how much it should cost. 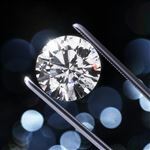 Read on for smart tips you need to know to get the best diamond for the money. Leave a comment about Diamond Fire: Light Up Your Engagement Ring? 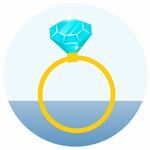 Our FREE course is the fastest and easiest way for YOU to learn how to save money and get a better diamond. 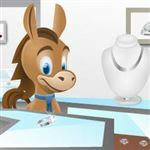 CreditDonkey is a diamond jeweler comparison website. We publish data-driven analysis to help you save money & make savvy decisions.